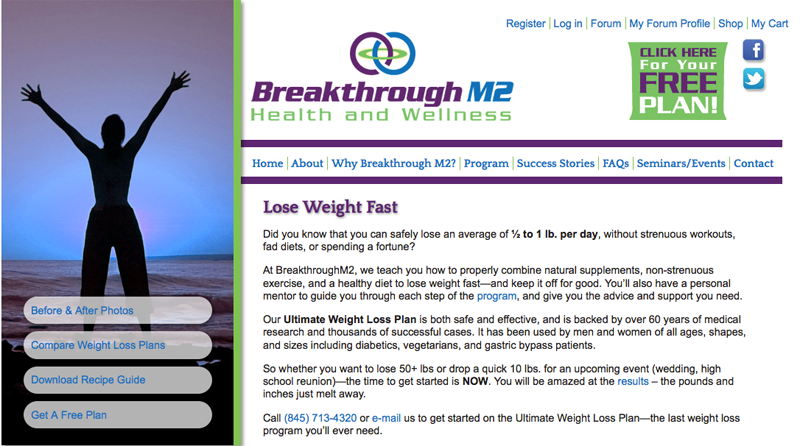 Breakthrough M2 is a rapid weight loss program where people can lose up to a pound a day through a healthy low calorie diet and all-natural supplements. The company needed a brand new website but knew they were competing against a lot of other weight loss programs. Working with an SEO expert, we used targeted search phrases, such as “Lose Weight Fast” to optimize placement on search engine rankings. We also recommended adding a comparison chart of the BM2 program vs. other popular diet plans such as Weight Watchers, Jennie Craig, Medi-Fast, and online-only diet sites, so that prospects could make an informed decision. Mostly, we wanted the website to resonate emotionally with people who are frustrated in their attempts to either lose weight or to keep it off. Well, seeing is believing and we convinced BM2 to include photos and testimonials of several clients’ weight loss success stories, including the company’s founder who lost 50 lbs. in just 65 days and still wears a Size 8 over three years later. Other recommendations included a simple 4-step explanation of the diet program, the benefits of the plan, and a helpful FAQs page. The client has experienced significant growth since the website launched in 2013.